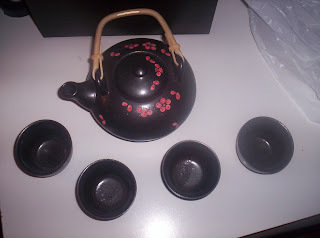 I got a new tea set today (actually my first one - all I have is a glass tea pot) from Melange Magique. It's quite pretty. I also indulged in a few flowering teas (they have astrological ones, so I figured "what do virgo, scorpio and cancer taste like ? :P " I haven't tried em yet...but I hope they taste good! I really like the flower petals on it - so pretty. In other news, I'm very excited - Devotchka and Ours are coming out with albums in the very near future. This means they will tour (well at least one of them, Ours came in the summer...maybe they'll bless us with their presence again?). Hopefully both of them will come! Both have posted new songs from their albums online and they're excellent. ooh... that's a nice-looking tea set. hurray for new devotchka and new ours! yeah, i hope there will be shows in montreal.